The Many Faces of the Blue Moon. I recently read that this very Friday, July 31, 2015, there’s going to be a Blue Moon. The next time this will happen will be in August of the year 2052. So share this with your friends in the next 5 minutes and you will come into a lot of money. One of these statements is true. So, to keep the Wedwand readership informed, I did some exhaustive research on the topic of the forthcoming event. Folks, it IS exhaustive typing b-l-u-e m-o-o-n on the Wikipedia page. 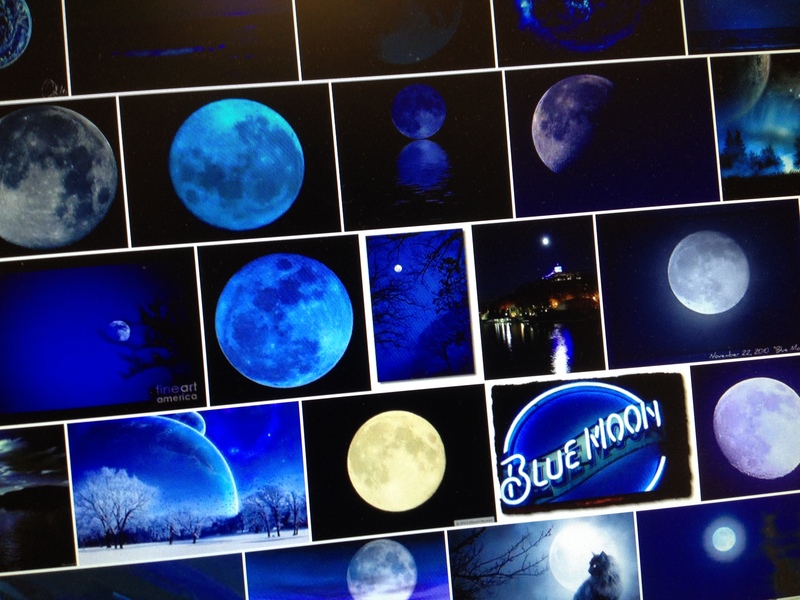 The first thing I discovered was that the Blue Moon is not actually blue at all. I’m afraid to even think what other disillusions I might find in I typed in e-a-s-t-e-r b-u-n-n-y. A Blue Moon it seems is simply the 2nd full moon in the same month. Silly me. I would have called such an event a “Two Moon Month”. But leave it to Galileo Figaro Magnifo or possibly the Farmer’s Almanac to spawn the very thought of calling such a moon the BLUE Moon. On a side note, in baseball, there was a pitcher for the Oakland A’s in the 1970’s whose name was John “Blue Moon” Odom. He is not to be confused with another pitcher for the Oakland A’s on the same team, at the same time named Vida Blue. Same team, different pitchers. But there were two Blues for the A’s in the 1972 World Series. You may also have heard of a beer that goes by the name of Blue Moon. It is a Belgian style wheat ale, but just like the Blue Moon in the sky isn’t blue, this Belgian beer isn’t from Belgium. Go figure. It is brewed in Colorado and has secret ingredients such as Valencia orange peels, Curacao orange peels and due to recent legislation may possibly one day include a hybrid specialty release containing Northern Colorado sensimilla called Dark Side of the Blue Moon. OK, I totally made that last part up. BUT, what if? THEN Wedwand’s looking for some royalties. Who had a hit song that went very well. The girls would all swoon to their number one tune. Somewhere this Friday, Wedwand is wishing that the planets will align, just like when someone orders Kentucky Fried Chicken in Kentucky or Boston Market in Boston. FOOTNOTE: The next Blue Moon is January 31, 2018, then again on March 31, 2018 and then on Halloween 2020.